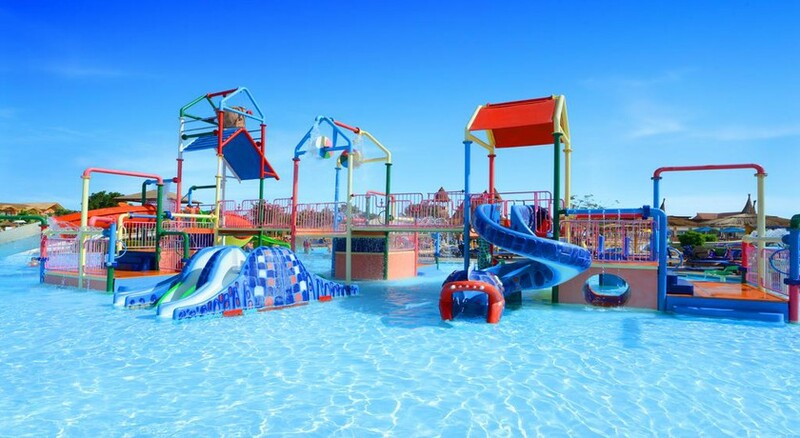 The perfect pick for families with its prime position on the coast of the stunning Red Sea in Hurghada, Jungle Aqua Park is best loved for its incredible waterpark complete with 14 swimming pools and 35 waterslides! 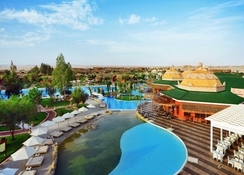 A firm family favourite for a Hurghada holiday, the Jungle Aqua Park Hotel welcomes its guests into 690 different types of customisable accommodations amidst a fabulous fun-filled waterpark environment to ensure you will never be short of activities to do. There are various bars and restaurants in the resort catering to everyone’s taste and a private beach located just a ten-minute drive away (shuttles are offered to and from the beach). The hotel also offers check-in & check-out, currency exchange, concierge service and babysitting facilities for the guests travelling with their little ones. 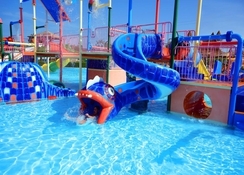 Jungle Aqua Park is located on the road to Safaga, along the coast of the Red Sea in Hurghada, Egypt. The resort is popular as an all-inclusive waterpark destination, with its private beach located just five minutes away. And if you’re keen for shopping and local food, then you’ll find shopping malls, restaurants and bars just 10 minutes of walking distance from the resort. The town is divided into three parts, El Dahar (old city), Sekalla (city centre) and Memsha (modern part), thus there is plenty to explore. 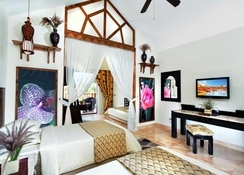 The resort features 690 smartly-appointed bungalows, boasting comfort, style and well-being. 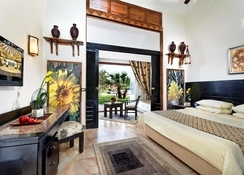 The bungalows are lavishly spacious, clean and colourful, blending the best of modern and traditional Egyptian culture, while many feature panoramic views from pleasant balconies or terraces. 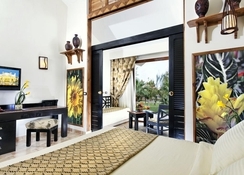 Bungalows in Jungle Aqua Park are available in three categories: Standard Double Rooms, Triple Rooms and Family Rooms. 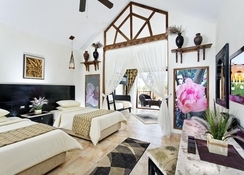 Keeping guests’ utmost comfort in mind, facilities in the room include a TV with satellite connection, safe deposit, baby cot (on request), 24/7 room service, private bathroom with shower, air conditioning, fridge — amenities differ according to room categories. The rooms offer toiletries and bathroom footwear; the rooms are customised with everything you will need on a luxurious holiday. Restaurants at Jungle Aqua Park serve a wide range of buffet meals, including Asian, Italian and Mediterranean cuisine. The resort hosts six buffet restaurants namely: Mediterranean, Tragin, Zum Kaiser, Viking, Asian Planet and Tarzan restaurants. Other than this, the resort houses eight lively bars, serving a huge collection of local and international drinks, including health drinks for the little guests. The private beach of the resort is located just five minutes’ way, but the Jungle Aqua Park's big show-stealer is its 14 massive pools, including heated pools, water games and 35 waterslides. There are two large swimming pools with sun loungers, parasols and beach towels, while the lawn by the pool is huge, covered by numerous shacks and thatch houses. In addition to the water fun, there is a game arcade that offers table tennis, billiards, video games and other indoor games. A mini golf course and a football court are also installed for outdoor enthusiasts, and aerobic and water gymnastic classes are held every day for interested guests. Kids can have fun in their separate playground or can be part of the various activities and programs at a mini club. There is a separate swimming pool and a disco designed for the kids. Waterspouts lovers can head to the private beach for Aquatic sport facilities such as yachting, sailing, snorkelling and scuba diving. Second time we have been to Hurghada , First time at the Jungle Aqua Park. We all had a great time, All the staff are very friendly & could not have looked after us any better then they did. The resort is wheel chair friendly, as my wife uses a wheel chair. The grand kid loved the resort & the aqua park. The food was good & plenty of it. This was the second time we've stayed at the Jungel Aqua Park Hotel. The staff are friendly, the slides are great, the rooms are big, although a little tired in places. We stopped at Jungle Aqua Park in February for 10 nights. The resort was very clean and the staff were really friendly. The water park is fantastic and the lifeguards very good at their jobs and with children. The food was ok, not fantastic but we managed to find something each night we liked. The complex is big with gardens that are really nice and well kept. We would come again for sure. Nice hotel with good Gardens.rooms could be a little bit cramped and cleanliness could be better in the bathrooms .Wi-Fi is shocking.